Previously on this post, we have explained the main functionalities on finite and infinite capacity using resources, resource groups, capabilities and capacities. 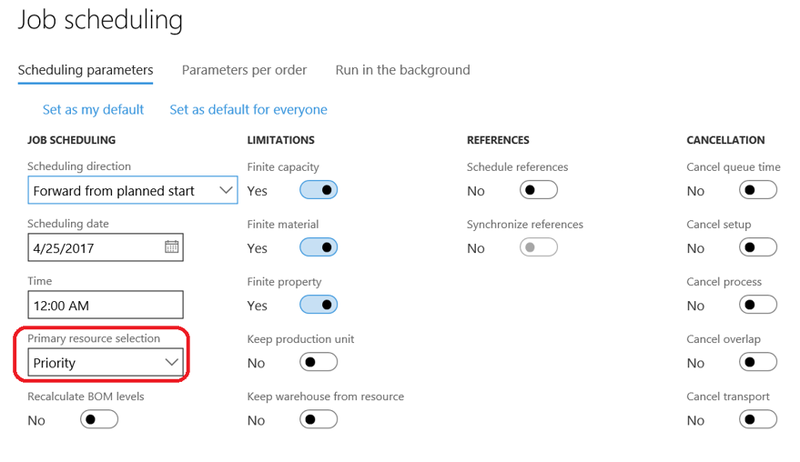 Today we are going to complete the previous post by testing the impacts on scheduling jobs when activating some options available in the production control module. On the M-LINE1 resource, we can update the calendar by using the one which is open only 2 hours per day from 3 pm to 5 pm. Moreover, we setup a priority of “1” to the capability “Extract”. The lowest value in that field will be prior than the highest. On the M-LINE2 machine, we setup the priority to 2. What we have to test are the 3 following production orders. Now we want to schedule them. Be sure the “Primary resource selection” is setup to “Priority”. Let’s see the impact on the Gantt chart : only the M-LINE1 machine is scheduled and for only 2 hours per day. Let’s go for testing the efficency setup on resource. 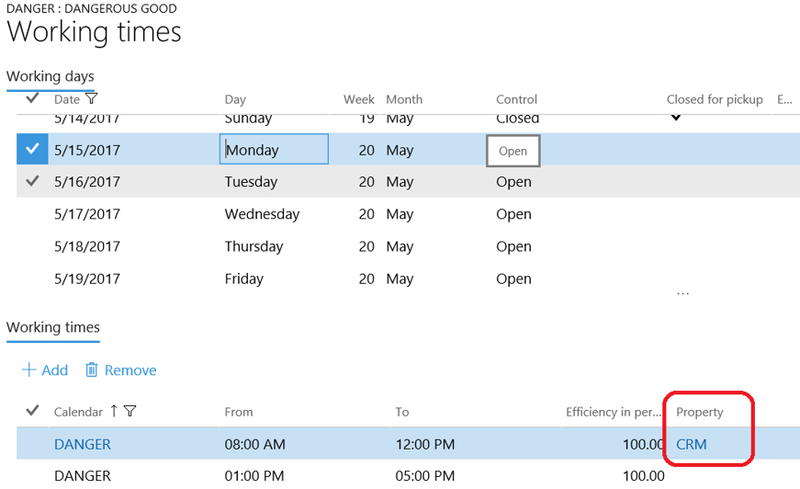 First we undo the previous setup about calendars so we get back to the standard calendar on M-LINE1. M-LINE1 is an old machine which is not very efficient as it used to be, that is the reason why we set it up to 50%. Then we schedule again the jobs for the 3 existing production orders. We clearly notice it takes 4 hours for the operation route 10 which respresents a capacity of 50 per hour. If we schedule again by selecting “Duration” for “Primary resource selection” instead of “Priority”, it will be the M-LINE2 machine used for the schedule. Let’s have a look on the level setup, available under the capability lines. A level applies mostly on operators but in that case we setup level on machines. For a dedicated capability, you can specify the level for a resource (a high value implies a better level) and also the level required for an operation route on a capability. Here we setup the M-LINE1 to the level 2 and the M-LINE2 to the level 1. The M-LINE2 is new and even if M-LINE2 is more efficient one or two month are required before managing the process. On the route operation, we specify the “Minimum level needed” for the capability “Extract”. 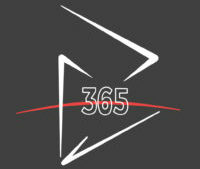 Then, we create a new production order for a quantity of 200, update it to scheduled. 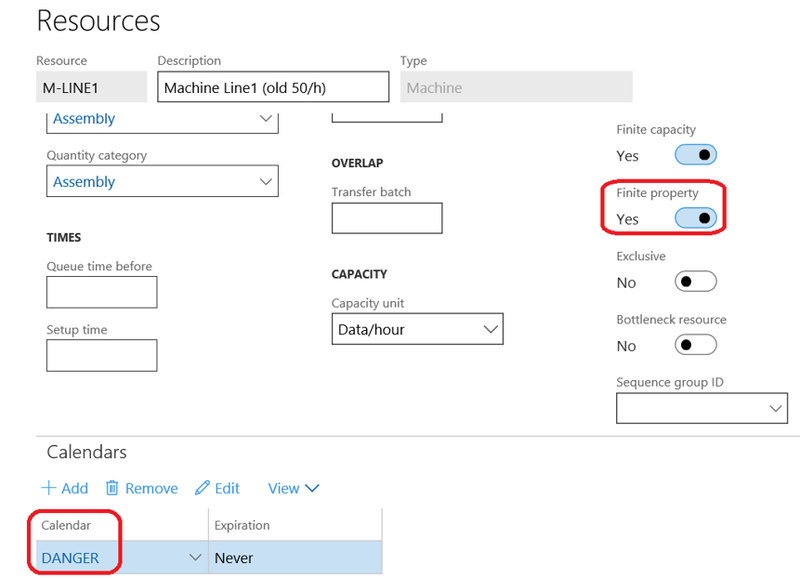 Using “Priority” or “Duration” on “Primary resource selection” will have no impact because only M-LINE1 is eligible according to the level required. 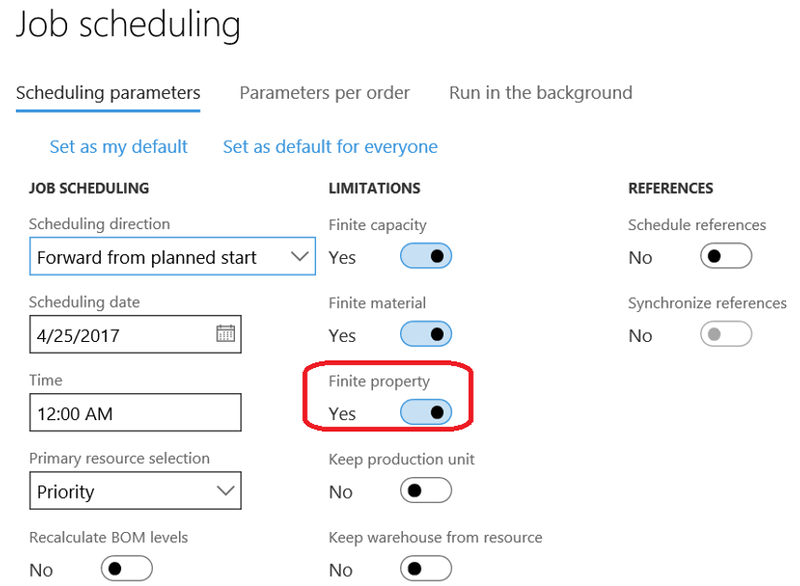 Let’s talk about properties when scheduling jobs for production orders. It’s interesting using them when you want to gather a kind of production on a dedicated day for instance. Here we deal with dangerous good we want to produce every Monday morning. 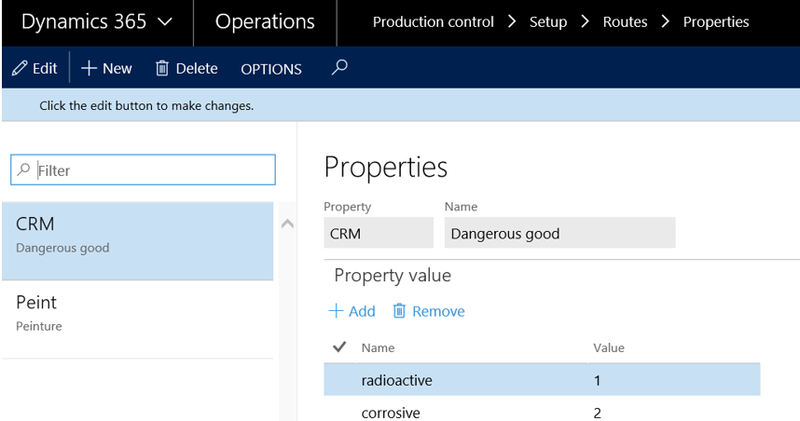 So the first thing to do is to create properties under Production control > Setup > Routes > Properties. You can add property values but I wasn’t able to find any impact with them on the process (I assume it’s just for information). When it’s done, you need to specify the property used on calendars. For this demo, I’ve created a specific calendar for dangerous good based on the standard one for working time. The only difference is for every Monday morning, I have setup the property value to my properties. Forgive me, my unconscious has betrayed me because I was thinking to the CMR which is the name of those kind of good in France, and I have dial CRM 😊. On the M-LINE1 resource, you will need to activate the “Finite property” checkbox for taking into account the property. Update also the calendar on the resource with the previous created. On the operation route, be sure to add the correct value on the “Property” field. 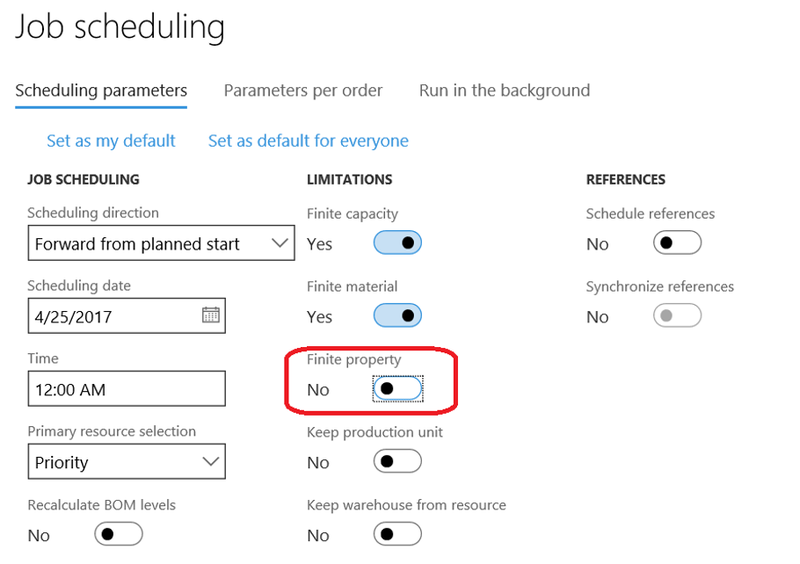 Then, we create a production order and schedule it with the “Finite property” option checked. Let’s have a look on the Gantt chart. The job has been scheduled on the first Monday available according to the current day. Let’s reschedule the job again, without the “Finite property” activated. The job has been scheduled on May 11th, which is the current day. That’s all for now about setup available for production capacity. 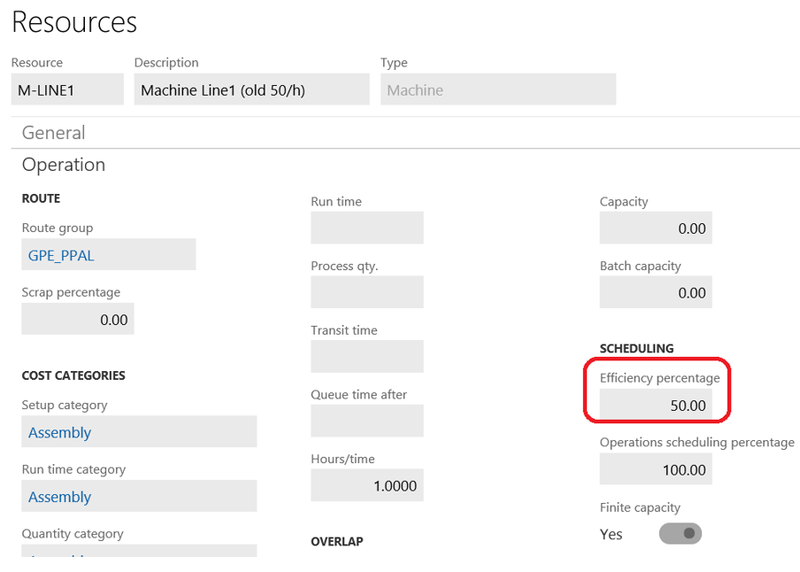 Partager la publication "Impacts of calendars, priority, efficiency, level and properties on finite capacity scheduling"
Can I group some production orders without setup property in working time cause I can’t fix day of week to produce?